Do you know what you’re looking for in your bathroom counters? Are you looking to update to relieve yourself from years of wear and tear? Durability and resilience is important to ensure that you are getting the most out of your renovation costs. 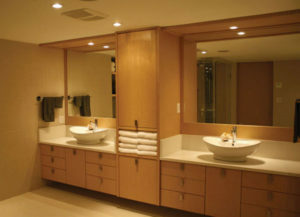 There are plenty of important questions you must address before getting started with any bathroom building projects, whether you are designing from scratch or updating tired spaces. Here are a collection of tips and recommendations from the friendly builders and homeowners here at RJS Stonetops in Vancouver. What you love – and what you don’t – is hugely important when planning a home project of any kind. Take your time looking at samples of materials and designs to be sure that you have a clear picture of what you want in mind from the start. What tastes appeal to you? Are you looking for something traditional and uniform – or are you interested in eclectic designs with bold schemes and modern twists? No matter your needs and dreams, Caesarstone composite quartz countertops are designed to adapt to all of your plans. No matter what you do, do it well! Composite quartz is more durable and reliable than many mineral alternatives, which makes it an obvious choice for all your building and renovation needs. Chips, stains, and cracks stand no chance against this tough surface, unlike other competing materials on the market. Composite quartz is a hard and non-porous material, meaning that it can withstand the presence of mildews and molds. It’s easy to clean and keep, too. This is especially important for bathrooms, which much endure high moisture levels and sanitary concerns. You won’t want to use any material that can harbor bad bacteria. The non-porous nature of Caesarstone quartz makes it an obvious and safe choice. 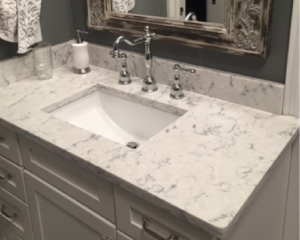 Bathroom countertops must also be able to rise to the challenge of fitting any design plans that you have for your space, be they traditional or out-of-the-box! Caesarstone quartz is a flexible and versatile material that allows you the utmost control and capabilities when it comes to designing the bathroom space you want. Some truly unique and fun designs can come from these possibilities. Keep the gentle, cool appearance of natural stone and mix it with the fun, creative flexibility of Caesarstone and you have a match made in heaven. Caesarstone composite quartz is truly unmatched in its offerings of durability and flexibility, making it an ideal product for any bathroom design. 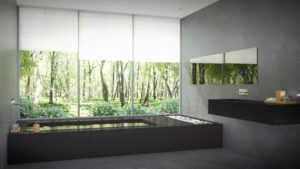 Long lasting and low-effort, Caesarstone is perfect for bathroom countertops that are practical and affordable. RJS Stonetops can help you get started with everything you need to know about Caesarstone countertops, as well as practical advice for renovating or building your dream bathroom. We are a Vancouver-based business that offers high quality products and workmanship and we pride ourselves in delivering the best customer service. For questions or comments, feel free to reach out to us on our website or on our Facebook page.